Enabling MS CRM tracing till 2015 new feature is through Registry keys only. But MS CRM 2015 gives this feature as UI. It is really useful for reading the errors we are getting in Plugins and workflow. Below are the steps to enable to tacing in MS CRM 2015.
set Enable logging to plug-in trace log as "Exception" as shown in below screen. Thats it, now we can read our exceptions in CRM application itself under below path. Trace log contains information related to Configuration, TypeName, MessageName, PrimaryEntity, OperationType, Depth, StpeId, CorrelationId, Mode, ExecutionTime, Duration, Excetion Message & Detail, Full Stack. 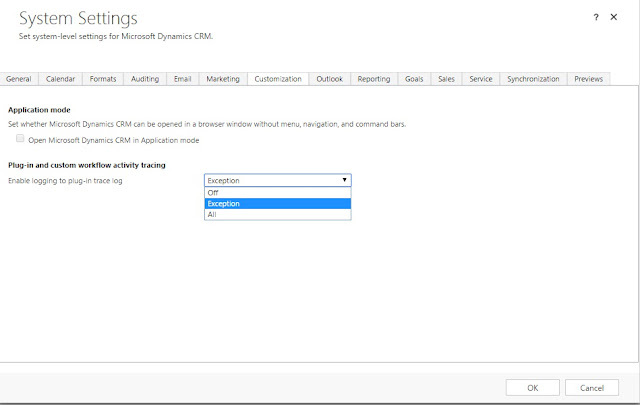 For CRM 2013 and below versions, we can enable the tracing through registry keys on CRM server. 4. Right click on TraceEnabled DWord ---> Modify ----> Set ValueData to "1" to enable tracing or set ValueData to "0" to disable the Tracing. 1. Right click on MSCRM ---> New---> DWord(32-bit) value ---> Give name as "TraceEnabled" set Value data as 0. Trace files will be generated in Trace folder which is in where MS CRM software get installed.